ComplianceSigns.com CONNECTION: Workplace Fatalities Down in 2012 Overall. Transportation Tops Incidents List. Workplace Fatalities Down in 2012 Overall. Transportation Tops Incidents List. The Bureau of Labor Statistics (BLS) preliminary count of fatal occupational injuries in the U.S. in 2012 is 4,383, down from 4,693 in 2011. The 2012 total is the second-lowest preliminary total since the survey was first conducted in 1992. The rate of fatal work injury for U.S. workers in 2012 was 3.2 per 100,000 full-time equivalent (FTE) workers, down from a rate of 3.5 per 100,000 in 2011. Overall, fatal occupational injuries are down nearly 25 percent since 2006. 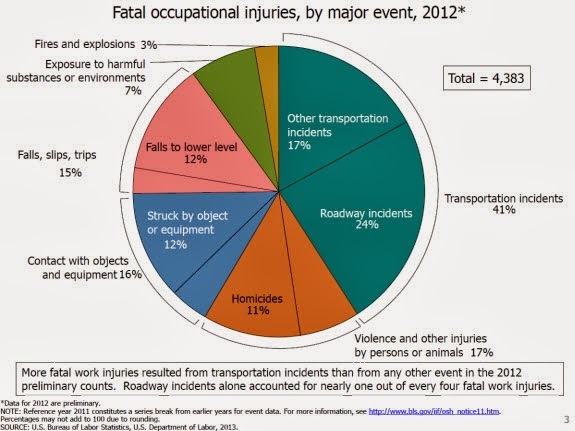 Transportation incidents accounted for 41% of workplace fatalities, making them the #1 cause. Workplace Violence, Contact with Objects, and Falls caused nearly half of all fatalities. Fatal work injuries in the private construction sector increased 5 percent to 775 in 2012 from 738 in 2011. The increase in fatalities in 2012 follows five consecutive years of declining fatal injury counts in the construction sector. Fatal construction injuries are down 37 percent since 2006. Fatal injuries declined among non-Hispanic white workers and Hispanic or Latino workers (10 and 5 percent, respectively) in 2012. Fatal work injuries were higher among non-Hispanic black or African-American workers and non-Hispanic Asian workers. Fatal work injuries involving workers under 16 years of age nearly doubled, rising from 10 in 2011 to 19 in 2012—the highest total since 2005. Fatal work injuries in the other age groups declined in 2012. Fatalities among workers 55 years of age and older declined for the second straight year. Work-related suicides declined 10 percent from 2011 totals, but violence accounted for about 17 percent of all fatal work injuries in 2012. Fatal work injuries in the private mining sector rose in 2012, led by an increase in fatal injuries to workers in oil and gas extraction industries. Fatal work injuries in oil and gas extraction industries rose 23 percent to 138 in 2012, reaching a new high for the series. Revised 2012 data will be released in the late Spring of 2014. Read more on the report, including chart packages, hours-based data and more, at the BLS website.